We offer complete range of Christmas decorative. These products are made using superior grade and environmental friendly material. Available in different shapes, sizes and color, these Christmas decorative are popular in the global markets. Printed with your favorite red and white pattern, the Candy Stripe Christmas Stocking is a sweet delight! 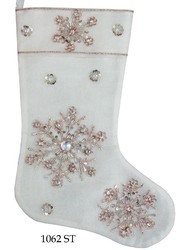 This lined, polyester stocking has a solid color cuff that can be personalized for FREE. Click on the "Personalization Info" link below each item name for more information about monogramming. Sold individually; each Christmas stocking measures 7.5"Wx17"L. Spot clean. Imported. Our organization is engaged in offering an extensive range of Christmas Stockings for decoration purpose, which is crafted using 100% pure cotton fabric. These are designed in various colors with patch work and are available in varied sizes. Riding on unfathomable volumes of industrial expertise, we are engaged in manufacturing an excellent assortment of Designer Christmas Stocking. - Mainly used to bind the two legs together. We provide christmas stocking that is manufactured using premium quality of raw material to ensure international quality standards. These are available in various colors, designs, and patterns. Crafted by hand, Christmas stockings bring cheer to any Home Decor. Decorated with glass beads, sequins and metallic trims with glittering Zardozi embroidery. Many variations of this motif exist. Huge variety of christmas decoration items available only at NJ Party Shop in Pune.